Here are a few photographs to give you a more ideas for patio deck designs. Deck - A "timber" deck at our local University. Virtually all hot dipped galvanised steel. 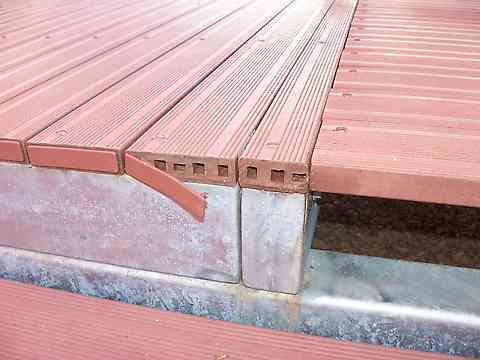 The joists are RHS section and the the decking and step treads are screw fixed to the steel with self embedding wing teks. I originally thought that this material was MDF, but on of my readers, Paul in Brisbane told me that it is a product called "Modwood". (Thanks Paul). "Made from recycled wood and plastic, our products are wood composites. 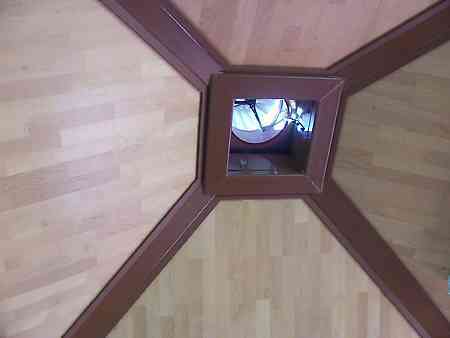 They look and feel like natural timber, but require none of the maintenance of traditional woods. You will not need to paint or stain our products since they already come in three contemporary colours (Redwood, Tallow wood and Grey) and will maintain their beauty for years to come". I flicked off a couple of the plastic end caps to the boards, to reveal that they are hollow extrusions. It will be interesting to see how long it hold up in our climate. I can't see it being as durable as solid hardwood, but I do hope it lasts, as the more of this type of material we use, the less we are encouraging the Indonesians etc. in their illegal logging activities. 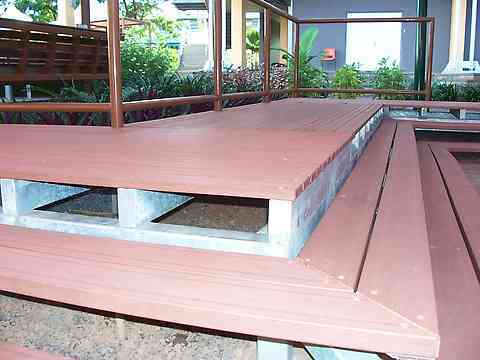 Deck - The same series of decks, showing built in seating and tables. The frames for the tables and seats are out of steel, which on a job like this with metalworkers involved is usually cheaper and more durable in our harsh climate that all timber. 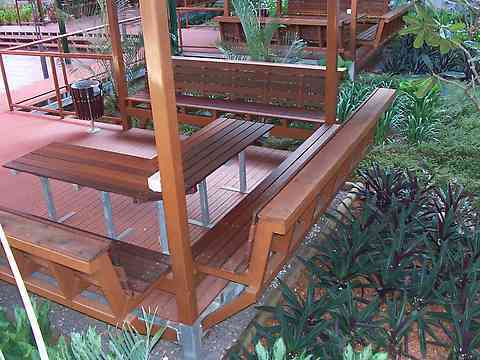 Solid timber used for the seats, backs and table tops of course. Deck - The roofs to the decks were lined on the ceilings in an interesting way that I have not seen done before. They have used cheap MDF floating flooring. I looks good and matches the rest of the job. This shot shows the underside of a 300 dia. roof ventilator, a common addition to roofs in the tropics, to remove the hot air. They are seldom totally still, even the slightest breeze gets them turning.